The global taps and dies market has been meticulously analyzed by Transparency Market Research (TMR). 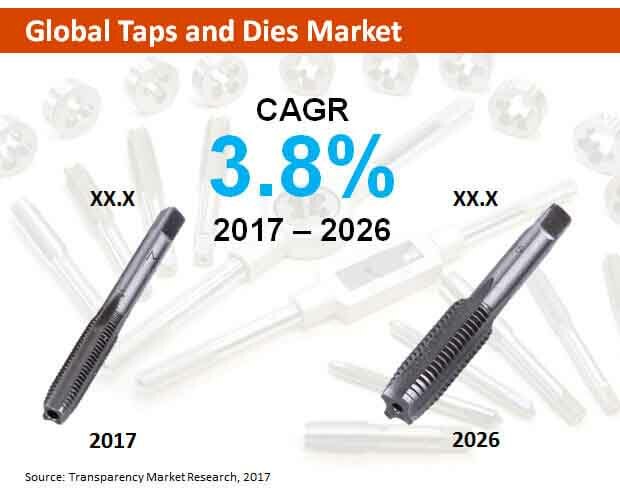 The research report includes a complete market intelligence package on taps and dies that covers analysis on major players competing in the global market of taps and dies. The competitive section in the research report covers analysis of the key players that encompasses aspects such as financial outlook, product overview, developments, innovations, key personnel, strategies and geographical spread. The key players are continuously striving to enhance their hold in the market and expand their global footprint with use of different strategies and tactics. Key players such as Kyocera, Atrax, M.A. Ford, Accupro, Michigan Drill, OSG, Chicago Latrobe, Guhring, Titex Tools, Triump Twist Drill, Cleveland and Kennametal have been profiled in this extensive analytical research report. According to TMR’s analytical research report on taps and dies, their global market is projected to expand at a value CAGR of 3.8% throughout the period of assessment to touch a significant market valuation of around US$ 2300 Mn by the end of the year of assessment. The global market for taps and dies has been segmented into product type, application, sales channel and region. With respect to product type, the global market for taps and dies is further segmented into carbon steel, alloy steel, high speed steel and tin coated. The use of tin coated and high speed steel is expected to showcase higher market share, with high speed steel being at the vanguard of dominance. The high speed steel and tin coated product type segments both are projected to grow at a similar rates during the forecast period, which implies that their adoption rate across the globe is similar across various applications. Alloy steel segment is the third largest with a significant valuation and is expected to grow at a value CAGR of 3.0% throughout the period of forecast, 2017-2026. Carbon steel segment, on the other hand, is the smallest with a low market share and also expected to reflect slow growth rate during the said period. By application, the global market is categorized into industrial and household and DIY segments. The application of taps and dies across these sectors various from region to region. However, to generalize the use of taps and dies across the globe, the industrial sector is expected to showcase higher demand for taps and dies as compared to the household and DIY segment. Industrial segment is expected to reflect dominance with a higher market attractiveness and market share in the coming years. This segment is estimated to reach a valuation higher than US$ 1 Bn by the end of the year of assessment (2026). Also, this application segment is expected to rise at a comparatively high value CAGR than the household and DIY segment during the forecast period. In the region category, Asia Pacific excluding Japan (APEJ) is expected to reflect increased adoption of taps and dies across various applications. Moreover, taps and dies market in APEJ is projected to grow at a high value CAGR of 5.3% during the period of assessment. Europe region is expected to lead the global market in terms of higher market value during the forecast period. By sales channel, the global taps and dies are expected to witness increased sales via retail and online channels. The retail distribution channel segment is the largest, whereas online segment is expected to gain high steam during the forecast period and is expected to rise at a high value CAGR during the 2017-2026 timeline.